By Nick Murray, Videogames Contributor. Welcome to part two of my trio of Final Fantasy Flashbacks. 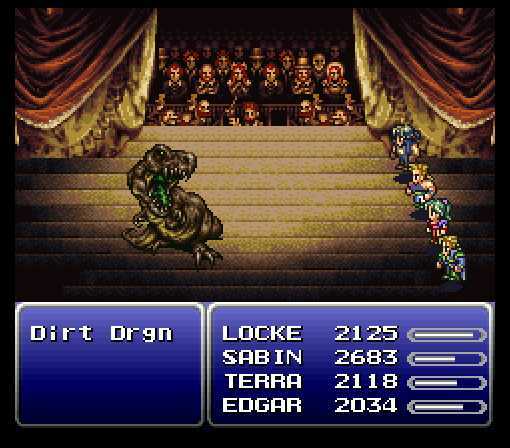 Last week we had a look at the undeniable game changer that was FFIV, and we continue this week with one of the games in the series that is often heralded as the best, Final Fantasy VI. Released in 1994, FFVI was the last outing the series had on the SNES, and was also the last Final Fantasy that had an exclusive release on Nintendo (at the time at least, being later ported to the PSOne as it was). Like FFIV, which was released as FFII in the west, FFVI was retitled as FFIII, meaning again that us westerners missed out on another stellar entry in the series (though thankfully, as mentioned, all available now on the trusty Playstation). In all honesty though, I could happily sacrifice those missing Final Fantasy games in exchange for FFVI, as missing out on that one would have been a real tragedy. It often tops gaming polls as being the best RPG of all time, and can always been found near the top of some best game lists in general, and for good reason. All the staples of the series can be found here, from Chocobos to summons, so I won't dwell on those aspects too much, but what I will say is that all these things that we know and love from the FF games are executed with such competence and maturity, a word that will feature a lot in this article, because that is exactly what this game is. Mature. Of course, FFVI still has the quirky sense of humour that frequents all these games, but you really get the sense that the makers of the game sat down before hand, looked at all the work they had done before, and said to themselves, “Let's really go at this and try and move people.” There has been a long running argument among academics of whether or not games can qualify as a serious medium for telling a narrative, and for my money FFVI is one of the earliest examples that supports the argument that it undoubtedly can. Again, like last week, I don't want to give too much away about the story, as discovering all the twists and turns for yourself is half the fun, but I will describe the opening sequence as to set up just how different in tone this game was to it's predecessors. So you turn on the power, Squaresoft briefly appears on screen, and then purple thunderous clouds fade in as downright eerie music screams from your TV (the first two notes are rather reminiscent of Michael Jackson's Thriller. Do with that what you will). 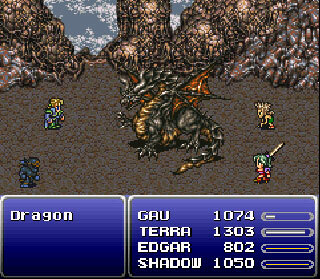 This lasts for a few moments before finally the title “Final Fantasy III (or VI)” appears on screen. What follows are shots of snowy mountains and steam filled towns, all the while accompanied by text, giving us the the background on a war that devastated the world, how magic almost entirely disappeared, and how engines and gunpowder became the way of the world. Already this is different from the previous games in the series. Nowhere to be seen are the green fields, rolling hills, castles, knights and wizards. 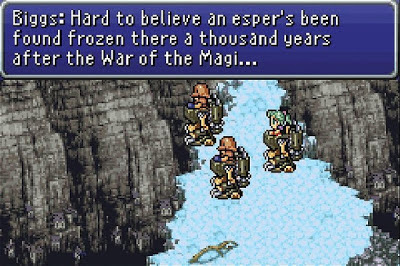 These things still exist in one way or another in FFVI, but they've been given a Steampunk make over, and even in these opening shots, you get the feeling of a dirty, lived in world. Pan down to three mechanical, human operated contraptions that aren't unlike the crate shifting, Xenomorph-bashing powerloaders Ripley and team use in Aliens. Some discussion between two of the characters operating these machines reveals that the third member of their party is a prisoner, and a dangerous one at that. Then the credits roll to yet another magnificent theme by Nobuo Uematsu, whose work throughout this game and the others in the series is nothing short of breathtaking, and we see the three characters trudge through a blizzard to their destination. After that, the game gets underway, and immediately you get the sense of this being an oppressed world, a confused world motivated by fear, where certain subtexts could be viewed as mirroring the racism and ignorance that exists in our own world. These were heavy subjects to be tackling, especially on a medium which at the time was still referred to as a “kid's toy.” These are areas that had been touched upon in previous FF instalments, but again they hadn't been approached with this level of maturity and depth, and were truly pushed front and centre in the game. All these things, from aesthetics to story elements, really helped create an atmosphere of darkness, and always leaves you with a sense of a bigger picture, which in places produces an almost cinematic scope. There's not much else I can say about FFVI really, gameplay wise it will feel very familiar to the FF games that came before it, with similar turn based combat, world maps, towns and dungeons. All I will say is that Final Fantasy VI, more so than perhaps any of the other FF game, is a definite must play, for every gamer. I know people who aren't fans of the series, or even JRPGs, but love FFVI. It's an important game not only for it's own series, but for gaming in general, and was really one of the first games to take a step towards showing that games can be more than just fleeting amusements for the young, and could be approached with a serious mind, and a degree of (here's that word again) maturity. Friday Flashback will now return to it's fortnightly routine, so in two weeks we shall conclude this Final Fantasy trilogy, with which game, I don't yet know. I've had suggestions for Final Fantasy VII, as well as Final Fantasy IX, so the consensus seems to be for the Playstation era of FF games. This is not yet set in stone though, so sound off in the comments below and let me know which game you'd like to see feature. Also if there are any games of old that you remember from your childhood that you think would be a possible candidate for a future Friday Flashback, let me know and I'll see what I can do. 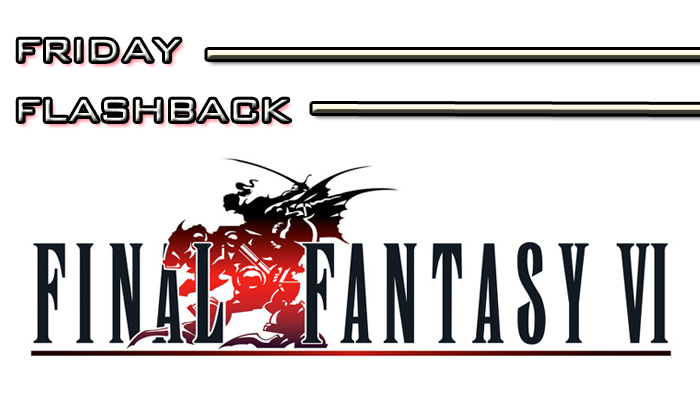 NEXT TIME: Nick will conclude his look at the Final Fantasy saga, and this years final Friday Flashback, with a recap of one of the entries from the Playstation One era. Live on Friday December 21st.